Akt kinase is a serine threonine kinase that exists in three isoforms, located in different chromosomes and has distinct sites of expression which orchestrates diverse cellular processes required for normal functioning of the cell. Though, these Akt isoforms have some overlapping actions, but they also have specific roles and interestingly, sometimes they even perform contrasting functions. There are various alterations such as amplification, overexpression, mutation, etc. associated with these isoforms which have great implications in the development of cancer. Moreover, these alterations also induce chemo and radio resistance in cancer cells that impede the existing treatment modules. Furthermore, many reports have shown their potential as efficient prognostic biomarkers. Although, many studies have discussed the implications of Akt kinase proteins in different cancers but in-depth analysis of isoform- specific involvement is least examined and hence demands more attention. 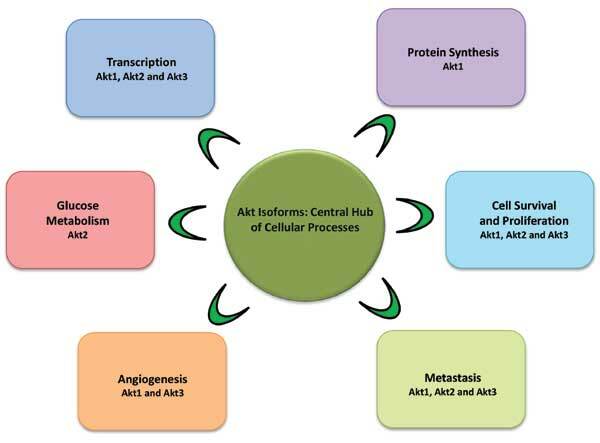 This review discusses the divergent roles of Akt isoforms comprehensively in different cancers and finding their immense prospects as potential targets for cancer prevention and treatment. Akt1, Akt2, Akt3, cancer, targets, biomarkers.